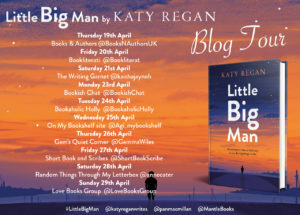 Welcome to my stop on the blog tour for Little Big Man by Katy Regan. There are some books that are very memorable and this is one of them. It’s superb and I’m reviewing it further down this post. I’d like to thank Katie James from Mantle Books/Pan Macmillan for the place on the tour and the review copy. The ebook is available now and it’s a steal at just 99p until the end of April. It’s also out in hardback. 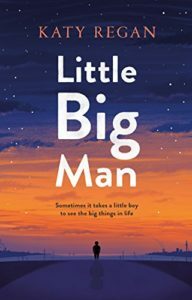 Oh my goodness, Little Big Man is the most wonderful book. It made me smile and it made me cry and it made me want to hug Zac. He’s the 10 year old boy who’s looking for his dad, the one that left before he was even born…didn’t he? The truth is there’s an awful lot more to it than that. His mum, Juliet, knows a lot more about his dad and he’s determined to get more facts so that he can try and find him. Along with his feisty, tiny friend, Teagan, he sets out on the FDM (Find Dad Mission). These two kids were just the most fantastic creations. They balanced each other out perfectly and I actually felt proud of them, even though they’re not real and I’m only the reader. This is a book that got to the very heart of me and in fact, got hold of my heart and squeezed it tightly. What I really liked about Zac and Teagan was that their voices were authentic. They didn’t sound too contrived, too childlike, but at the same time it was clear they were children and had a child’s way of looking at things. I absolutely loved Juliet too. She had issues, but she recognised them and started to deal with them. She never stopped loving Liam, Zac’s dad, and as the book progresses we are drip-fed details about what actually led to Liam leaving. This is a book that deals with grief, love, guilt, weight issues, bullying – these are some meaty topics but Regan approaches them with understanding and care. You want to know what hurts the most about getting that letter? The feeling that something beautiful and sacred has been soiled. Because to me, Zac has always been perfect – the only thing in my life that is – yet here’s this letter in black and white telling me that he isn’t; that the only thing that I’m proud of in my life isn’t even good enough. I marked that passage just because it really moved me, but I could have quoted and quoted so many beautiful passages from this book. It’s a stunner of a read. It broke my heart and put it back together again many times and there was one scene in particular, close to the end, that saw me in tears. It’s an absolute beauty! Katy Regan was born in 1974 and brought up in the northern seaside town of Morecambe. 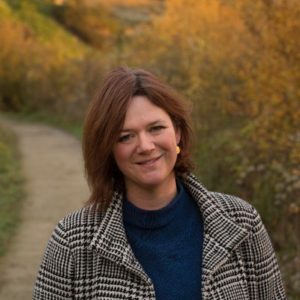 She went on to study English and French at Leeds University where she became features editor of the student newspaper before moving to London. She wrote for various magazines and newspapers before becoming Commissioning Editor at Marie Claire magazine. Katy’s first novel, One Thing Led to Another, was published in 2009 and her second, The One Before the One, in November 2010. 2013 saw the publication of How We Met, closely followed by The Story of You in 2014. Little Big Man is her fifth novel and her first for Mantle. Katy, who has one son, now lives in Hertfordshire. I’m about halfway through the audio version of this book and, like you Nic, I’m absolutely loving it. The author really brings all the characters to life but I’m in awe at how she seems to have really got inside the head of Zac. I’ve got a feeling this will be one of those books I don’t want to finish. Isn’t it just wonderful, Doreen? I’m sure you will love the second half too.